One of the most sustained and vigorous public debates today is about the value—and, crucially, the price—of college. But an unspoken, outdated assumption underlies all sides of this debate: if a young person works hard enough, they’ll be able to get a college degree and be on the path to a good life. That’s simply not true anymore, says Sara Goldrick-Rab, and with Paying the Price, she shows in damning detail exactly why. Sara Goldrick-Rab is Professor of Higher Education Policy & Sociology at Temple University, and Founder of the Wisconsin HOPE Lab, the nation’s only translational research laboratory seeking ways to make college more affordable. She is the recipient of the William T. Grant Foundation’s Faculty Scholars Award and the American Educational Research Association’s Early Career Award, and in 2016 POLITICO magazine named her one of the top 50 people shaping American politics. Her latest book, Paying the Price: College Costs, Financial Aid, and the Betrayal of the American Dream, is an Amazon best-seller, and has been featured on The Daily Show with Trevor Noah, the New York Review of Books, and CSPAN’s Book TV, among other venues. Page last updated by CURE at 11:08 am February 22, 2017 . 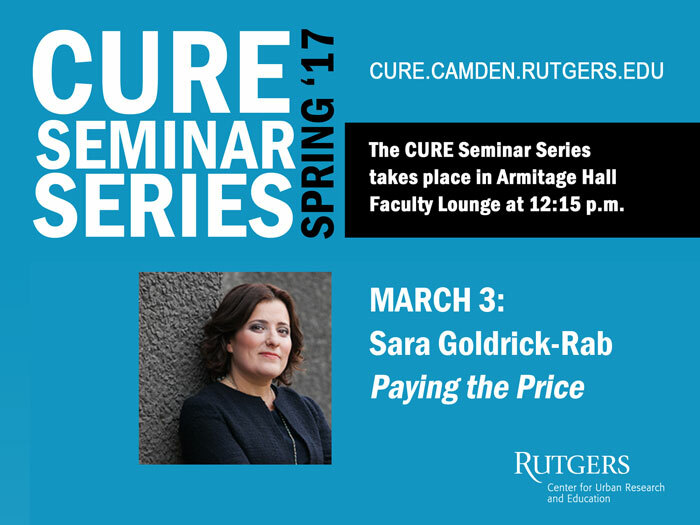 This page was printed from http://cure.camden.rutgers.edu/events/cure-seminar-series-sara-goldrick-rab-paying-the-price/ at 9:02 AM Saturday, April 20, 2019.